Wp Header Bar is a simple yet attention-grabbing, customizable responsive barresting at the top of your WordPress targeted pages to help drive traffic to a specific destination on your site. You can use wp header bar as a call to action to read your latest blog post, sign up for your newsletter, take advantage of special pricing, etc. etc. 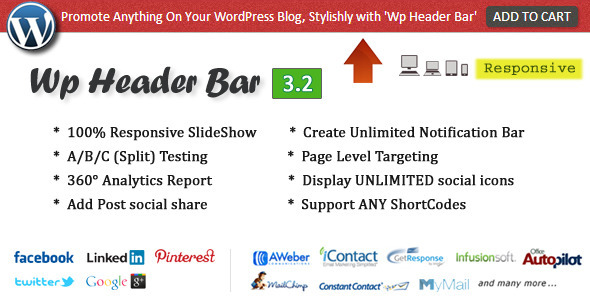 Create unlimited “header bar” and target to specific post/page or categories for your “header bar” to appear. 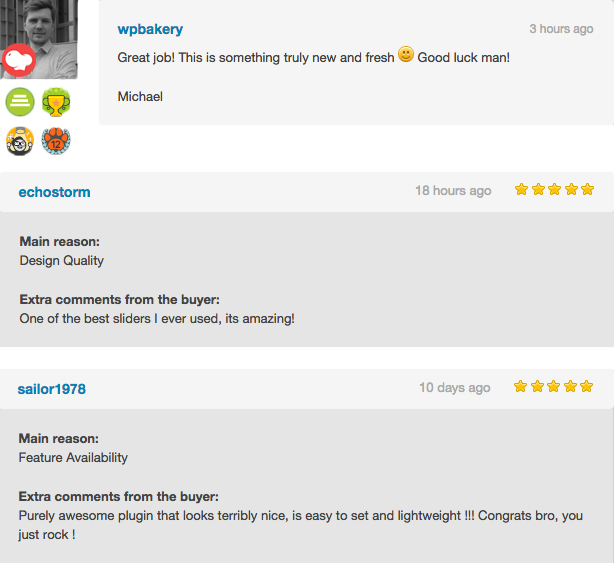 Cute Link: Super easily convert your long LINK URL into clean and professional SHORT LINKS. Cloak Link: SUPER easily cloak your cute link and promote ANY affiliate products without any worry. Check to display Social Links With Notification Bar. Display UNLIMITED small icons that link to your social networking sites. Check to remove Notification and Display Only Social Links. REQUIREMENT Ad Plus List Building PopUp 2.6 or later required to activate Optin Bar feature. Form auto filler: Grab visitor’s attention by automatic filling the visitor’s name/email in the optin form for more sign-ups!. Split Name into ‘First Name’ and ‘Last Name’ feature. Only Email: Display ONLY ‘email’ field feature. This entry was posted in Advertising and tagged analytic, bar on any site, header bar, message, non-wordpress, notification, optin box, page level targeting, responsive header bar, schedule, social icons, social links, social share, split test, wordpress on September 11, 2015 by Vera Jaman. 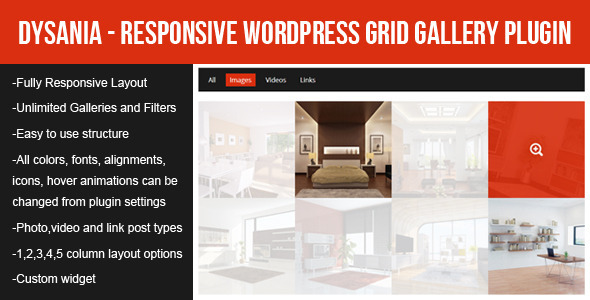 Dysania Grid Gallery is a responsive wordpress portfolio & gallery plugin. 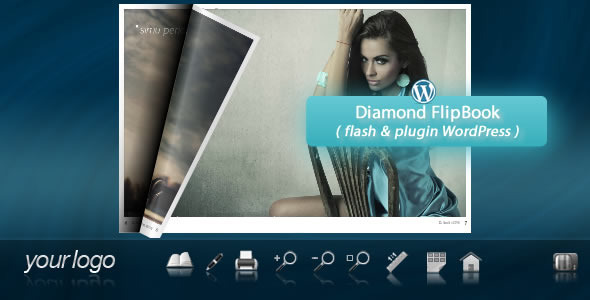 It is not only an image gallery plugin. It also supports videos,iframes and internal/external links. This entry was posted in Galleries and tagged css3, filterable, gallery, grid, image display, jquery, photo gallery, plugin wordpress, portfolio, product, responsive, unlimited, wordpress, wp plugin on September 8, 2015 by Vera Jaman. 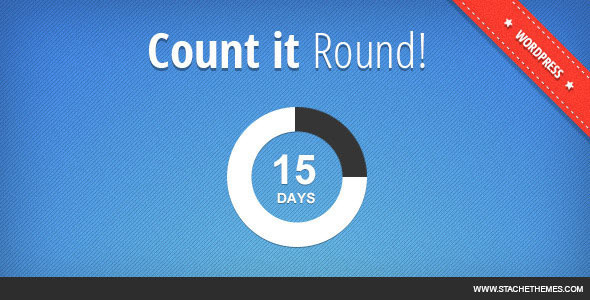 Count It Round is a WordPress plugin that allows you easy and fast to create circular countdown timers for your website. From your Admin Panel go to Plugins -> Add New -> Upload -> Browse and pick the countitround archive file. Click “Install Now” button. Click “Active Now” after the plugin has been installed. A new menu should now appear in your Admin Menu called “Count It Round”. From your Admin Panel go to Count It Round -> General Settings. 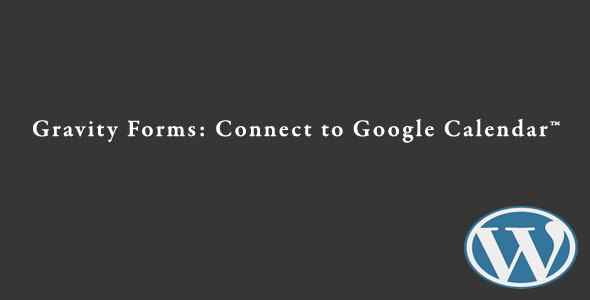 The plugin uses the shortcode [countitround] to display the front-end content. From your Admin Panel create new Page or Post and type [countitround]. 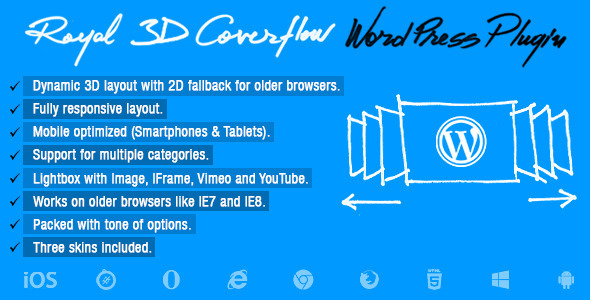 NOTE: The plugin uses CANVAS (HTML5). If you plan on having multiple countdowns with different settings you can use the “Generate Shortcode” feature. You can easily generate the shortcode with all options available through the WP Admin Panel -> Count It Round -> General Settings. Adjust the desired settings and click “Generate Shortcode” button at the bottom of the page. This will generate the full shortcode for you ready to use. This entry was posted in Blog / Magazine and tagged circular, clock, countdown, jquery, js, plugin, shortcode, timer, wordpress on September 7, 2015 by Vera Jaman. 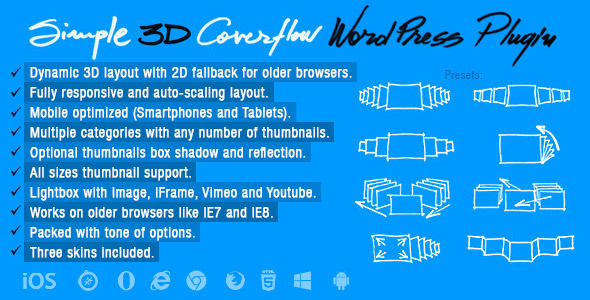 What is Simple 3D Coverflow WordPress Plugin? 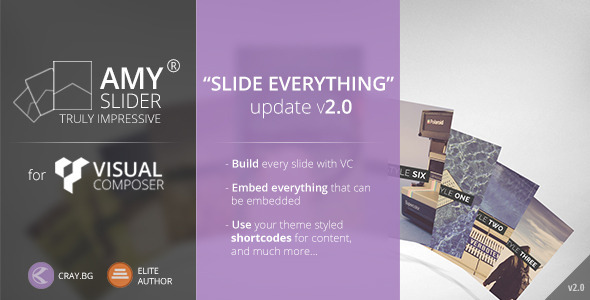 Simple 3D Coverflow WordPress Plugin is a fully responsive media 3D coverflow wordpress plugin that allows you to display media content with an unique original layout from a 3D perspective. It’s perfect for any kind of presentation, for anyone that wants to deliver a great impact on their visitors. It runs on all major browsers and mobile devices like iPhone, iPad, IOS, Android and Windows 8. Also supports unlimited categories and each category can have any number of thumbnails. Mobile and desktop optimized (iPad/IOS demo). Dynamic or static tooltip for the center thumbnail. 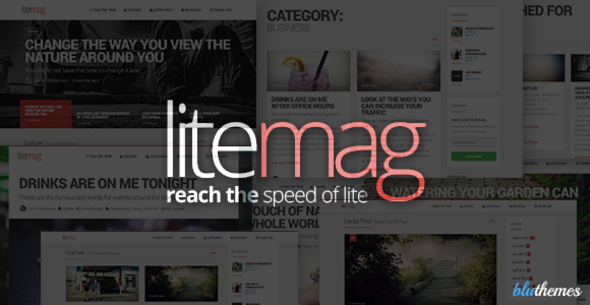 Image, youtube, vimeo, iframe lightbox support. Three skins included along with the psd files. When viewing the coverflow on a mobile browser the scrollbar is automatically disabled, the swipe functionality taking its place. On IE the coverflowXRotation and coverflowYRotation do not work. This affects only preset 9. This entry was posted in Galleries and tagged 3d, carousel, coverflow, fluid, html5, image, infinite, loop, mobile, plugin, resizable, responsive, touch, video, wordpress on September 2, 2015 by Vera Jaman.